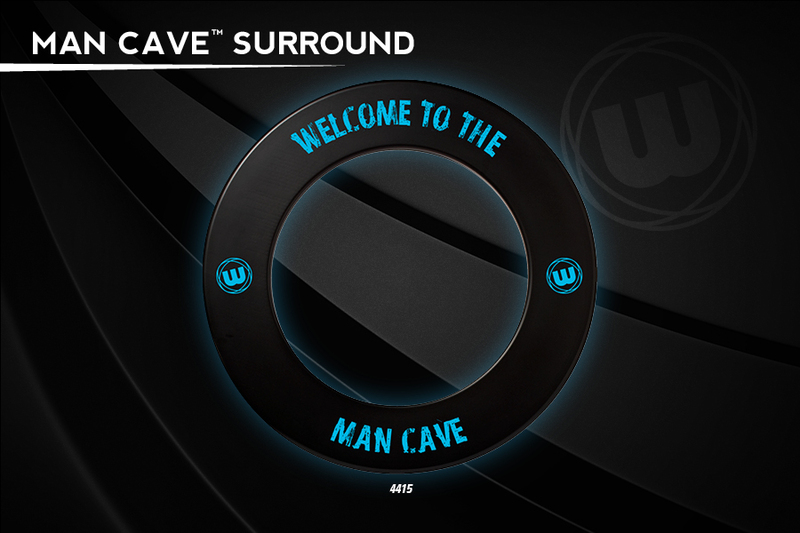 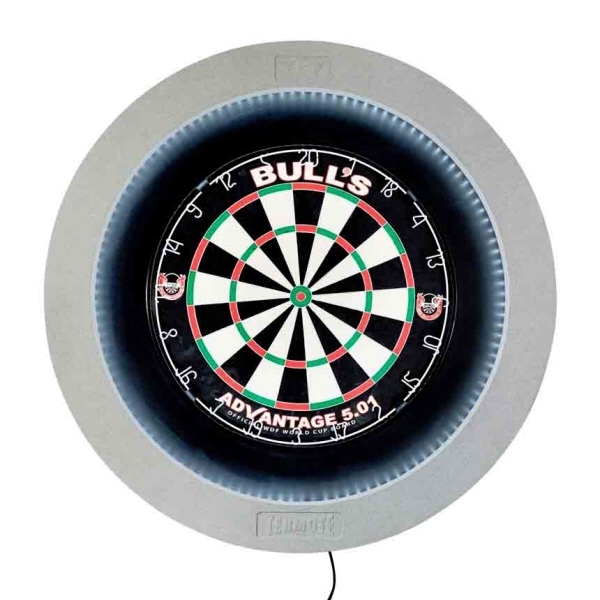 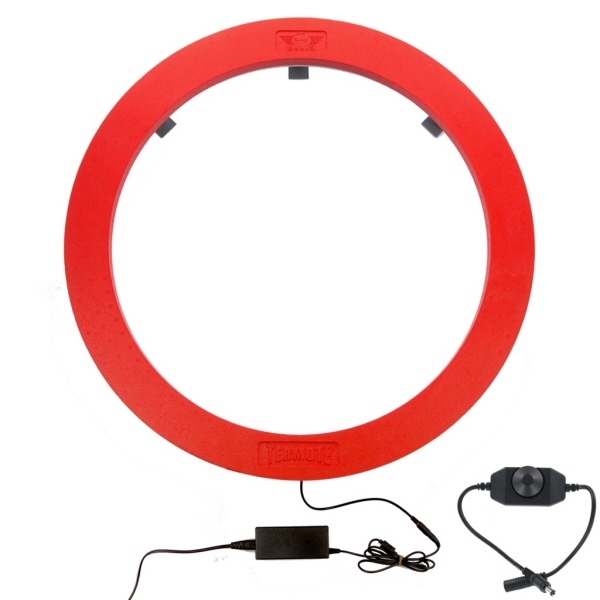 Dimensions: 41 1/2" X 25" X 1 1/2"
Simply connects to the surround around the dartboard, Easy to Fit and very Lightweight. 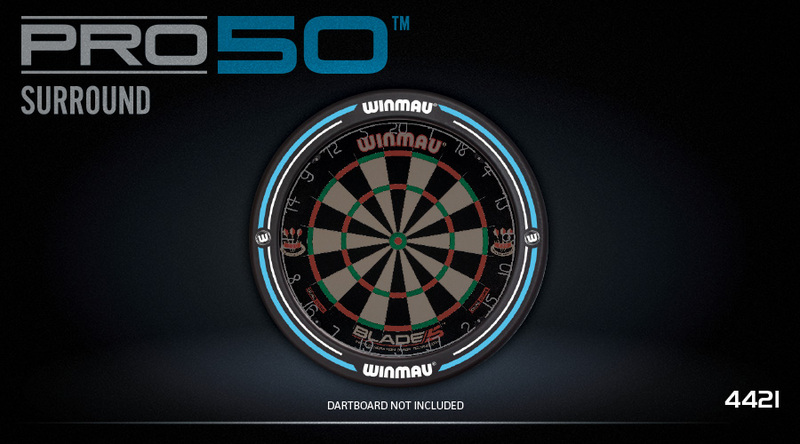 Erases all shadows on the dartboard. 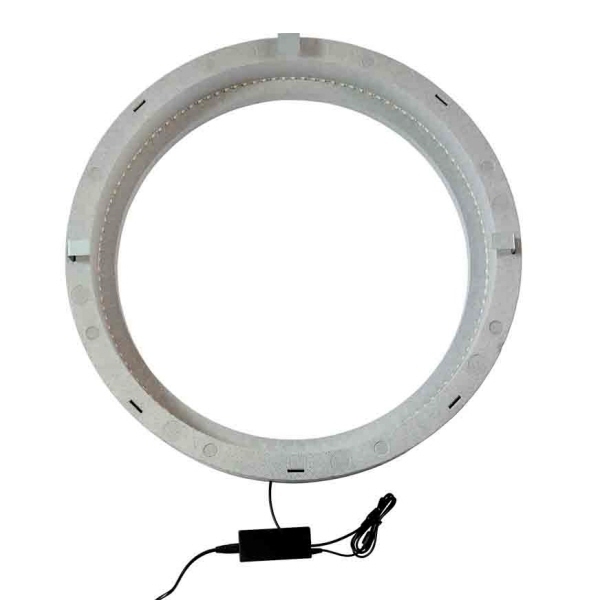 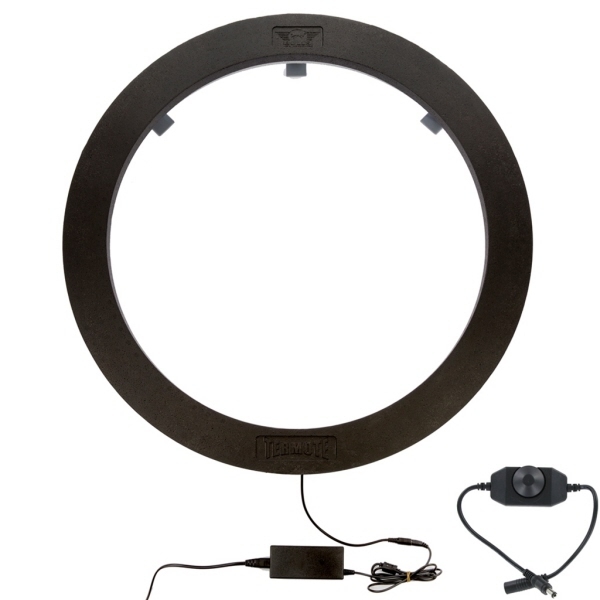 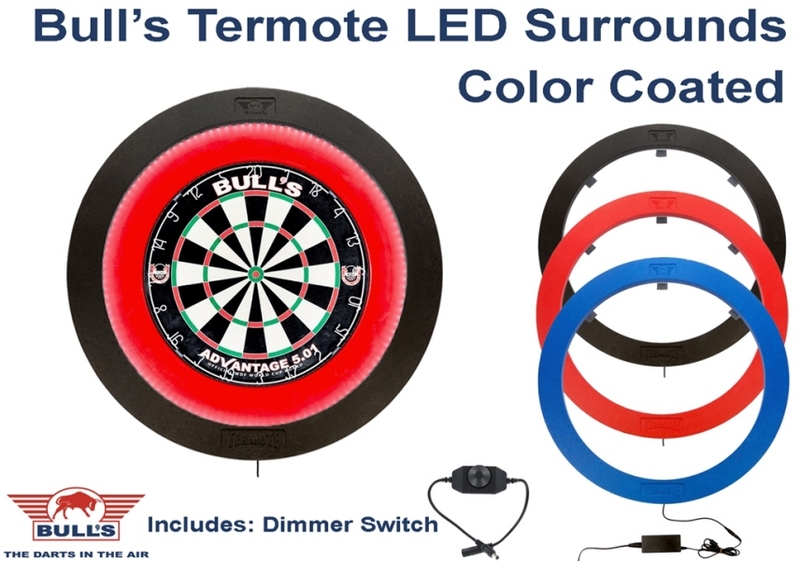 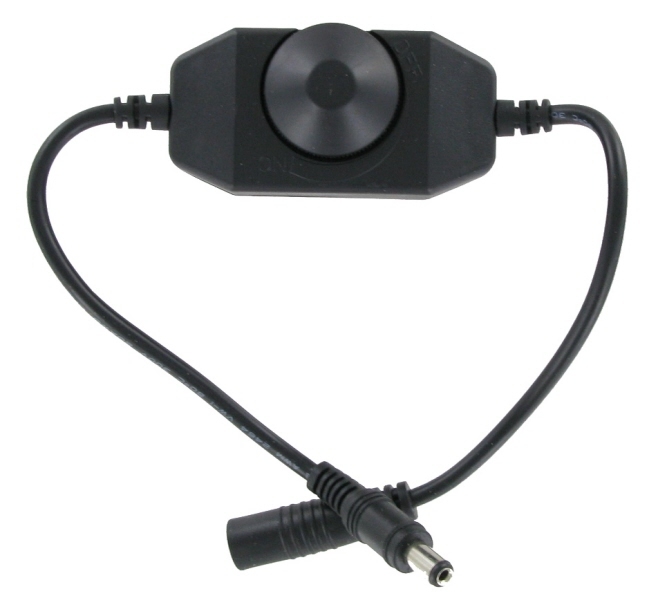 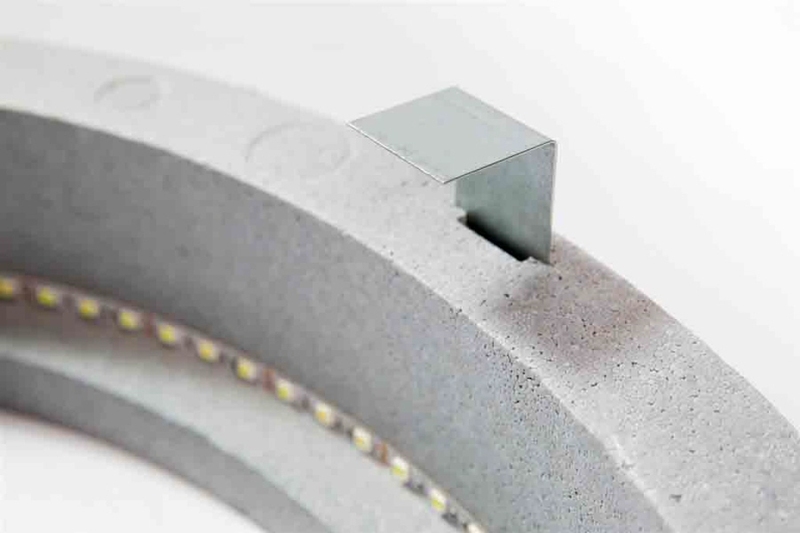 Bulls Dartboard Lighting Dimmer Switch Simply connects to the LED Lighting System to allow light to be adjusted to your preference. 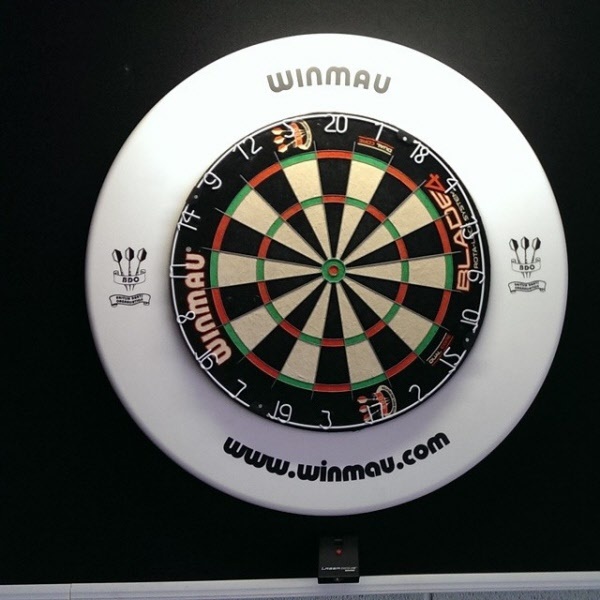 Works on Bulls Termote LED system and Target Vision 360 Lighting System. 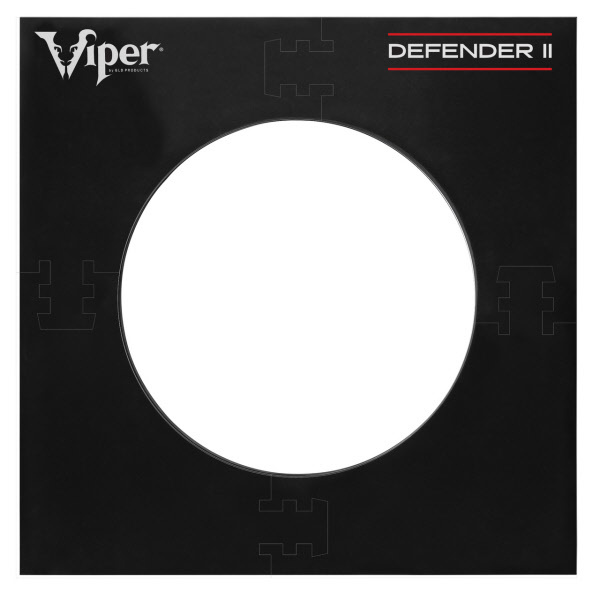 Inside dimensions: 28" x 28"
Outside dimensions: 28 1/4" x 28 1/4" x 1 1/4"
Wall protector dimensions 28 1/4" x 28 1/4" x 1"
Dimensions: 25" x 34 1/8" x 3/4"
Protect your walls with our American made premium backboards. 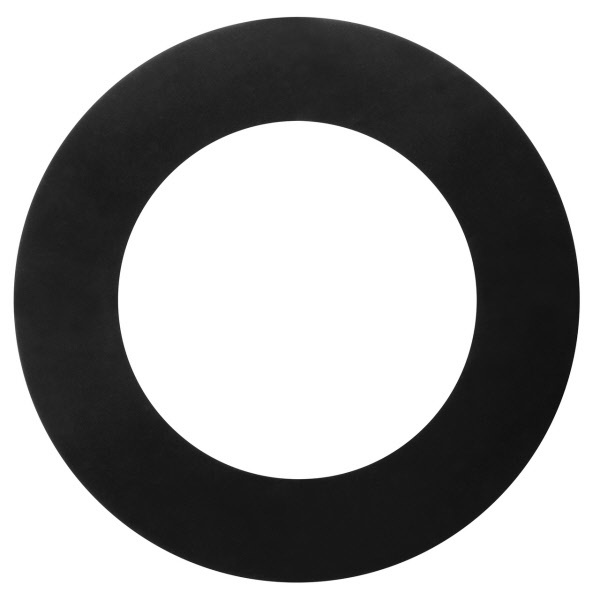 The new wooden backboards have a sleek black painted finish with a durable carpeted back. 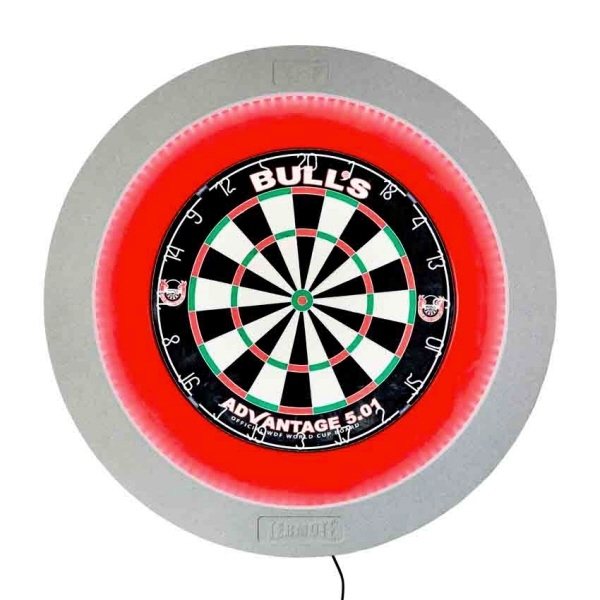 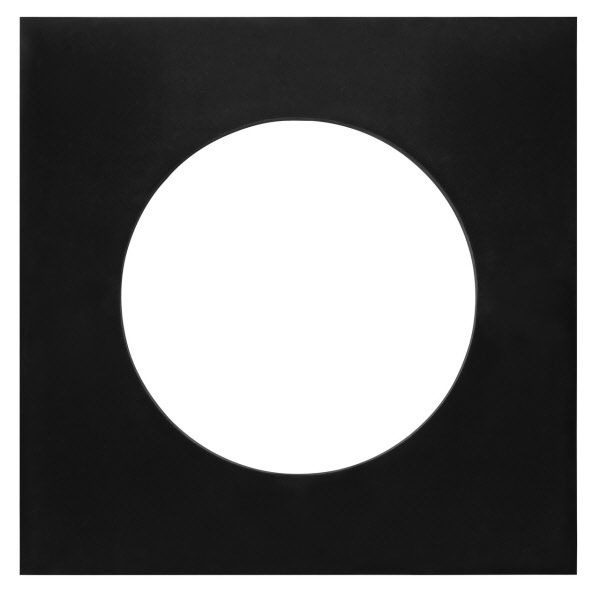 Dimensions: 25" x 28 3/8" x 3/4"
Intergrated dartboard surround with no assembly required. 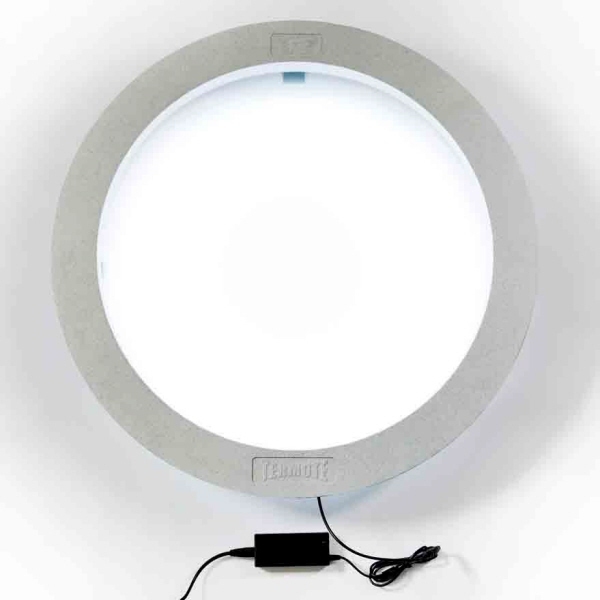 360 degree non-glare illumination. 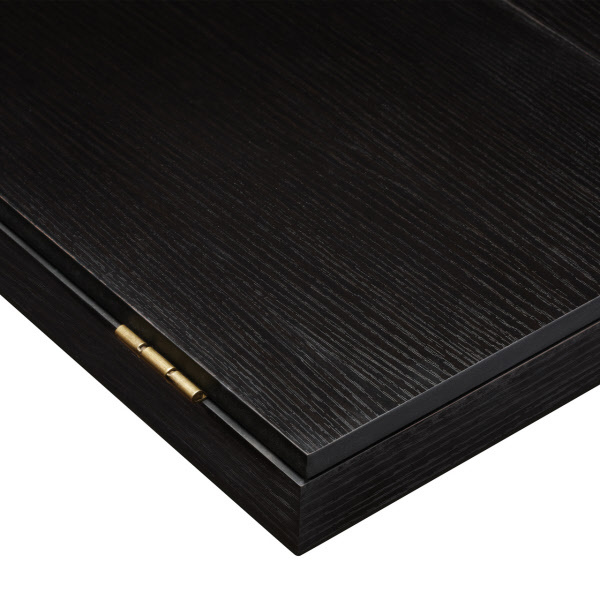 Pro-Slimline surround included. 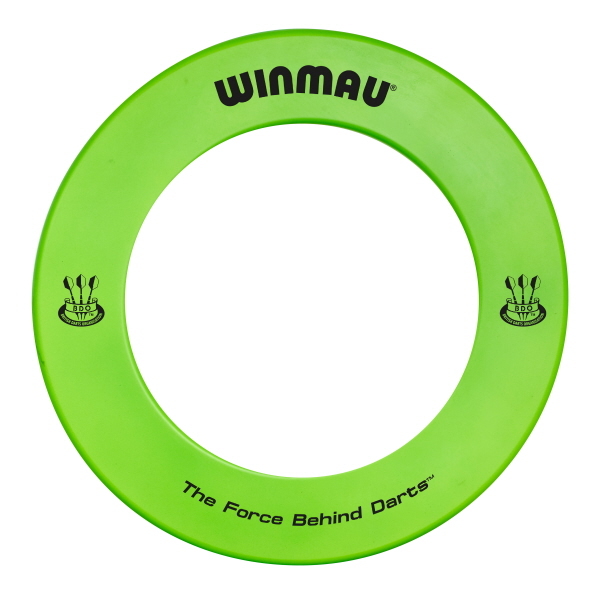 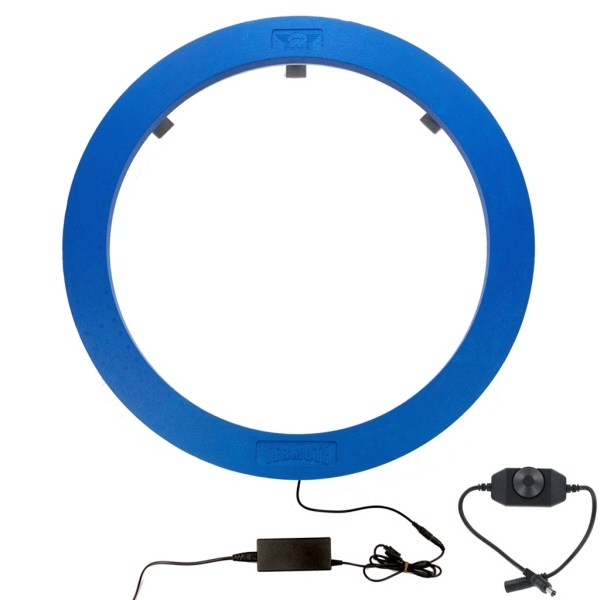 Durable fiberglass outer shell and is ready to play in seconds. The Cambridge Cabinet is constructed of solid oak, box joints and self-closing hinges. 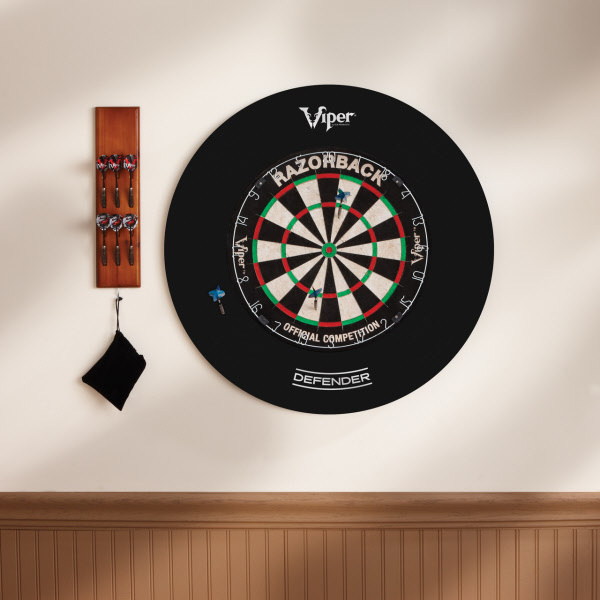 Decorative arched top adds style to your game room, while cabinet doors keep board hidden from sight when not in use. 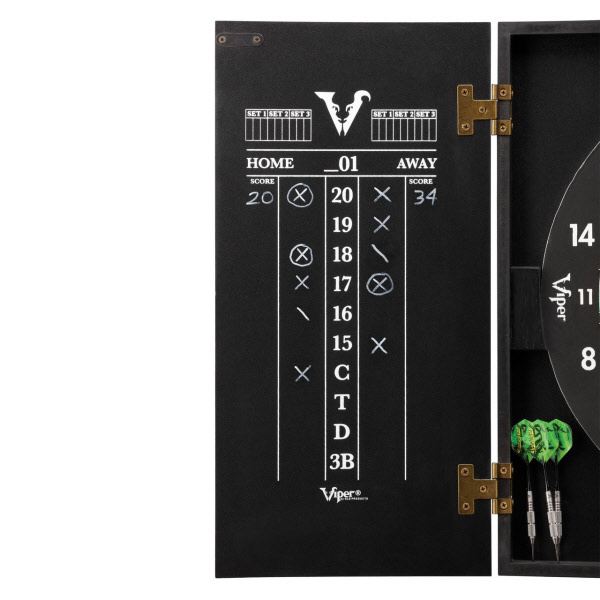 No-mess scoring with dry-erase scoreboard, and outchart for quick reference. 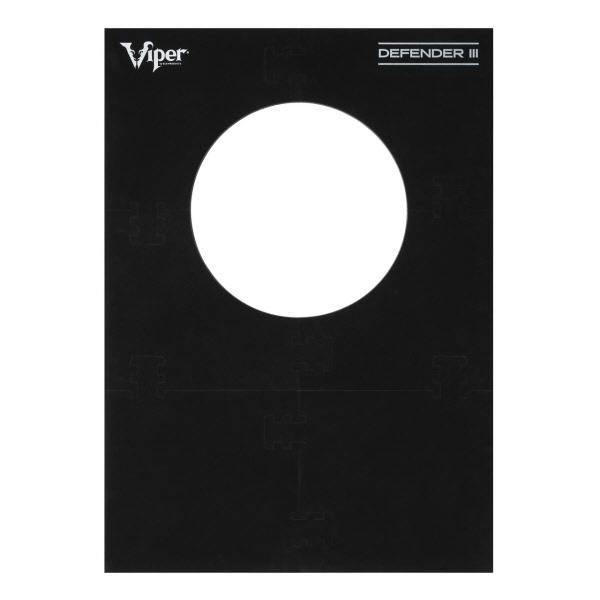 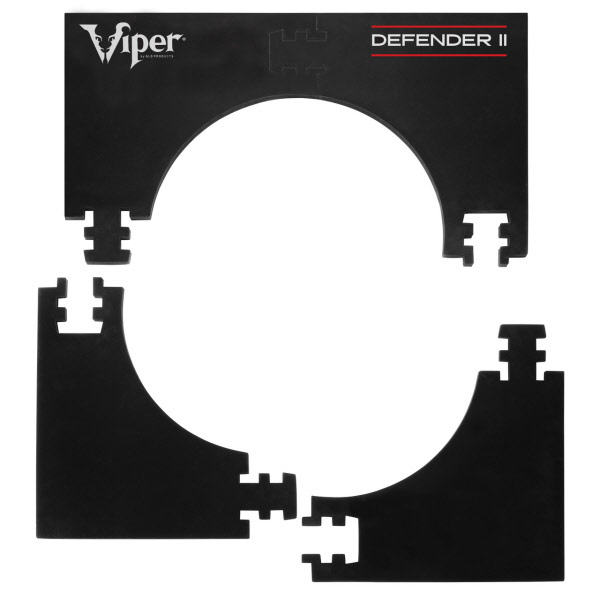 Inside Dimensions: 21"H x 21"W x 2 5/8"
The simplest solution yet to protecting your wall from errant dart throws is here with the Viper Defender II Dartboard Surround! 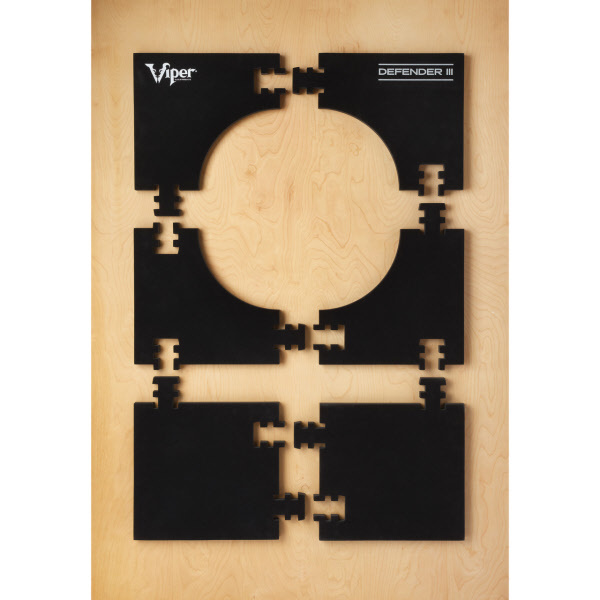 This stylish V-Foam surround requires no installation tools, just snap it together around your dartboard and you are ready to play! 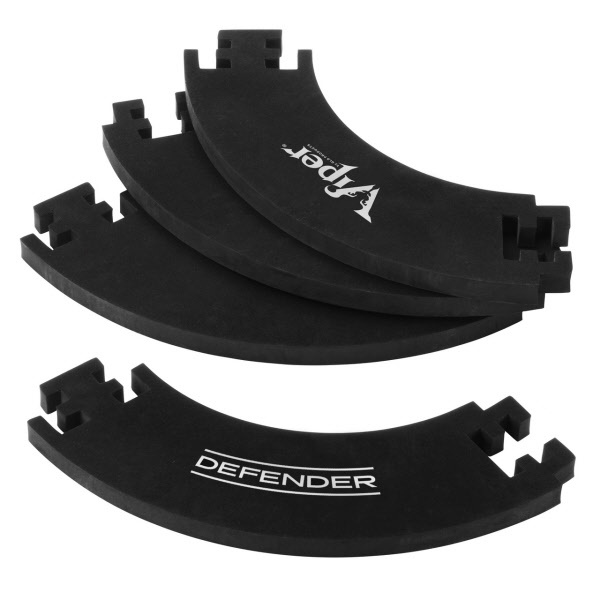 This tough and durable defender will stand up to the most wicked throws, should an errant throw slip by. 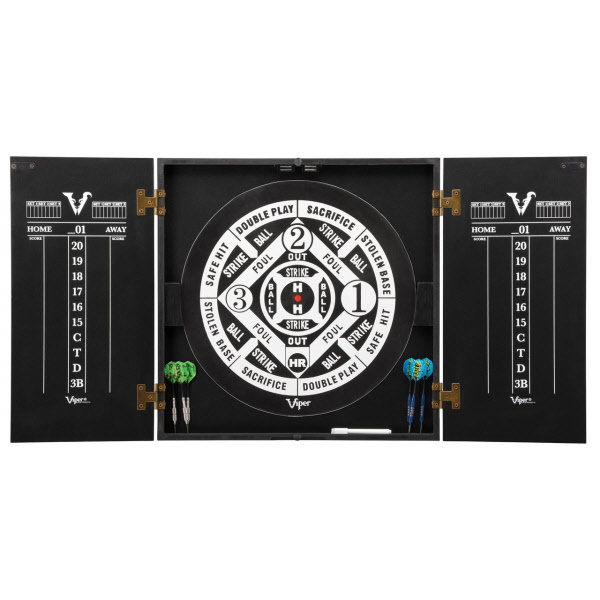 The deep black color adorning this board will match the black in any Viper dartboard and will blend seamlessly with any decor. 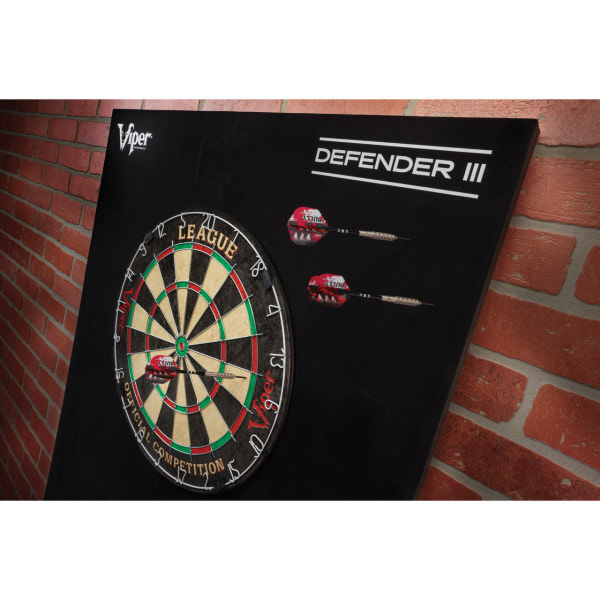 Take the guesswork out of deciding which board to purchase, as this surrounding defender will fit perfectly with any regulation sized sisal dartboard! 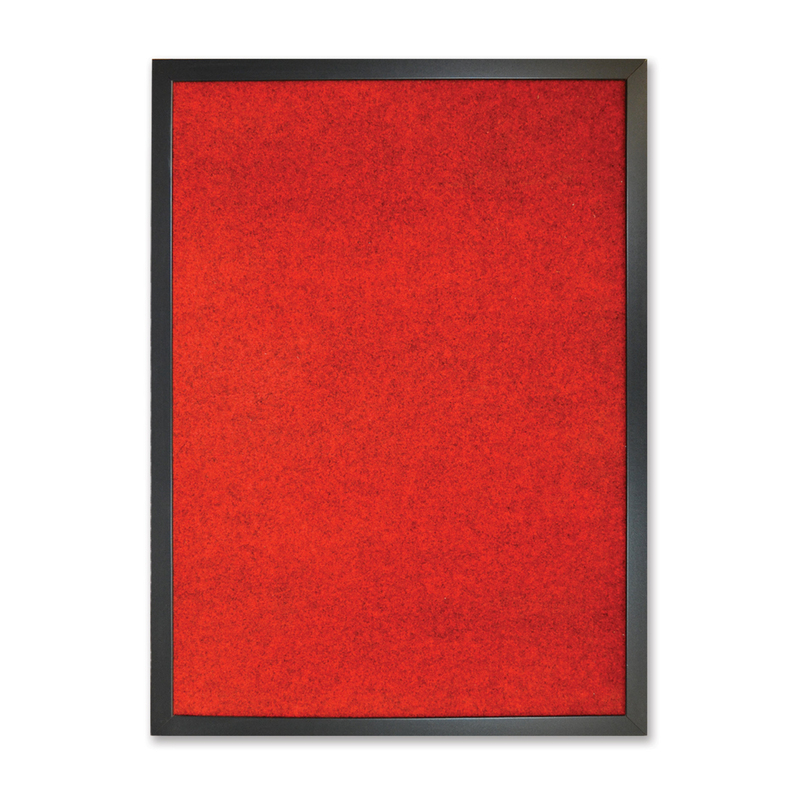 Protects your wall for an astonishing 3.8 square feet! 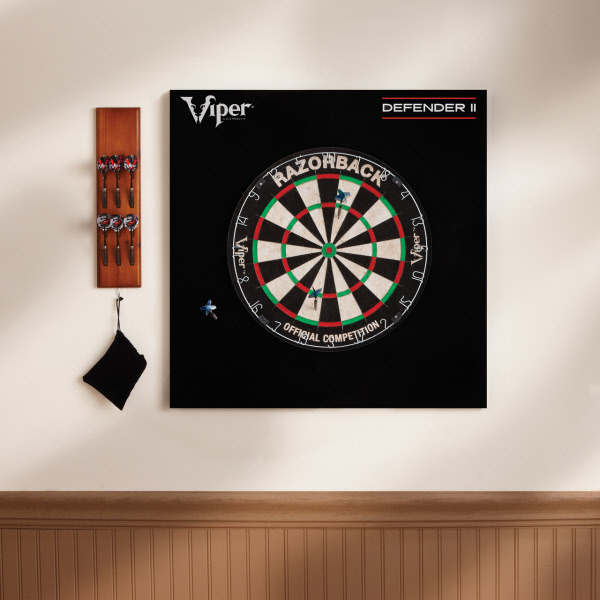 The newest innovation in protecting your wall from errant dart throws is here with the Viper Guardian Dartboard Surround! 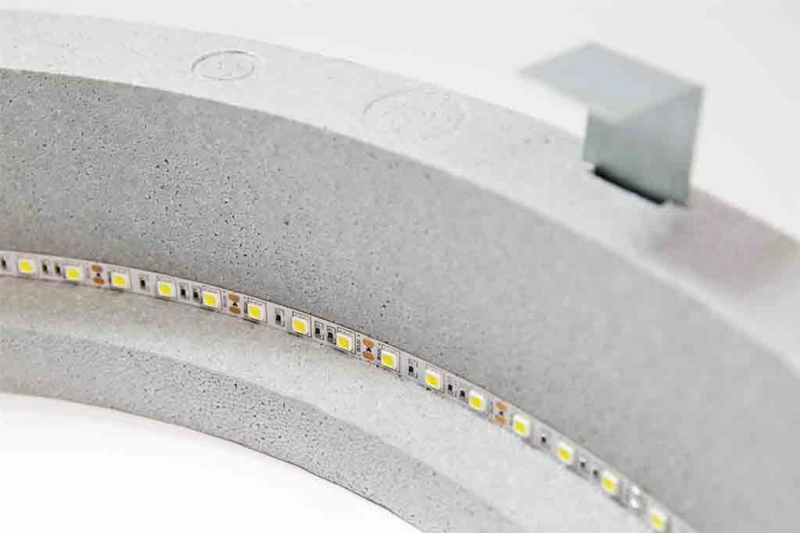 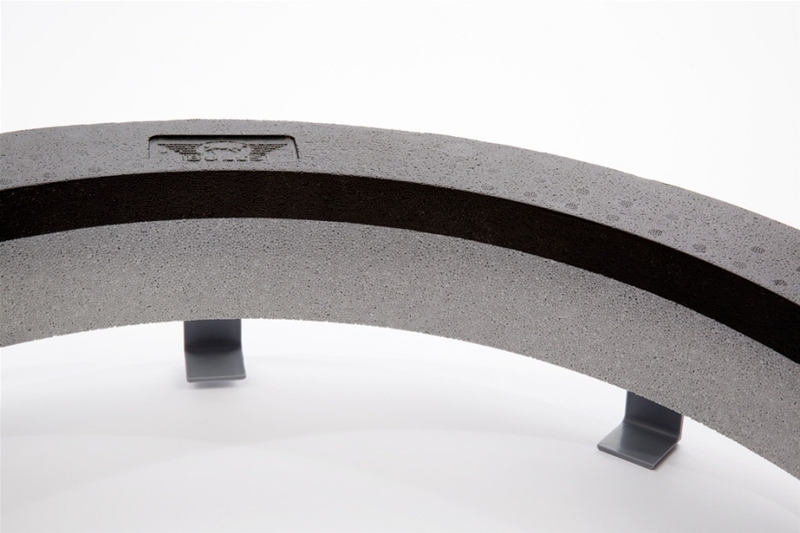 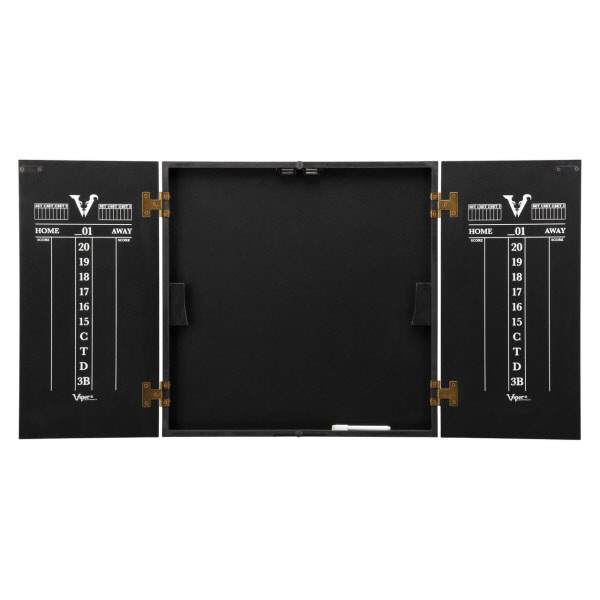 This stylish polyurethane surround requires no installation tools and no assembly, simply fit the surround around the board for a perfect fit! 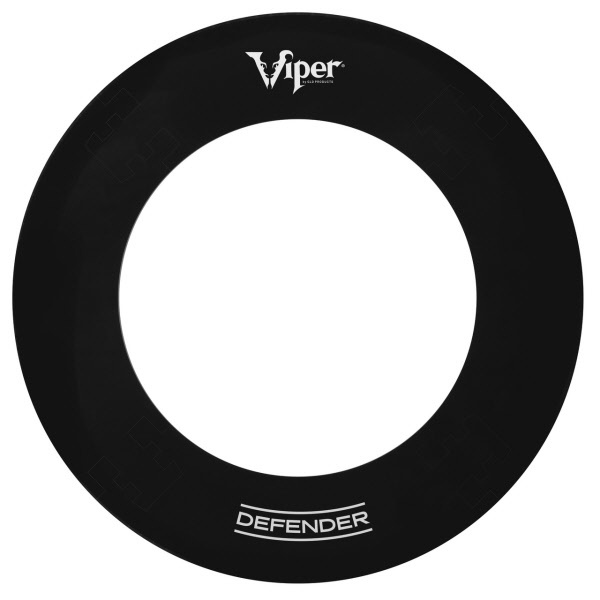 This tough and durable defender will stand up to the most wicked throws, should an errant throw slip by. 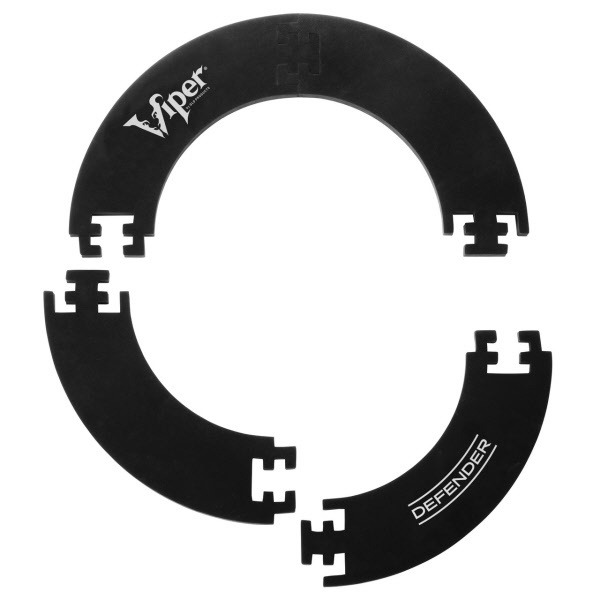 The Viper Guardian is available in five awesome colors, to match any decor. 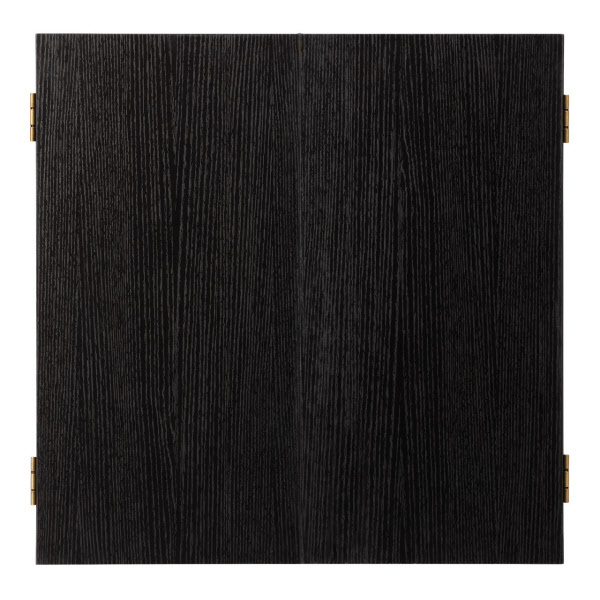 The wide profile of the Guardian covers an amazing 2.7 square feet! 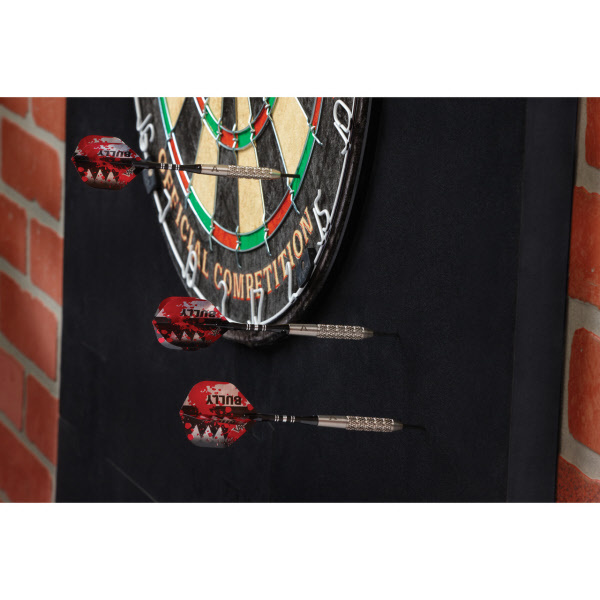 Take the guesswork out of deciding which board to purchase, as this surrounding wall guard will fit perfectly with any regulation sized sisal dartboard! 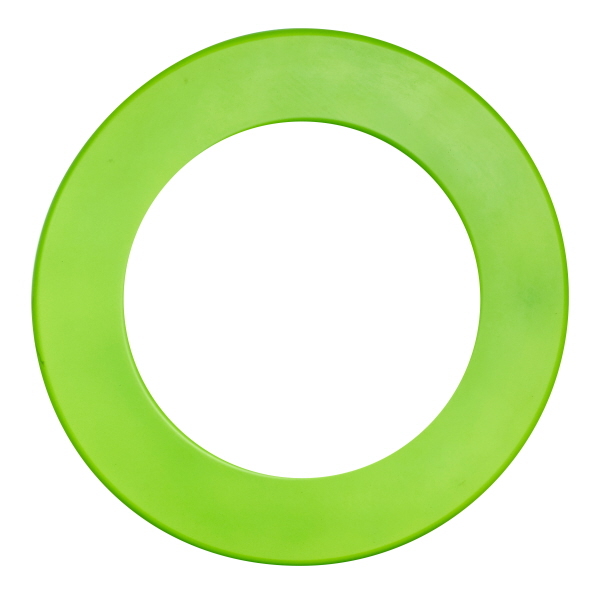 Defend your wall from dents and dings with this polyurethane surround. 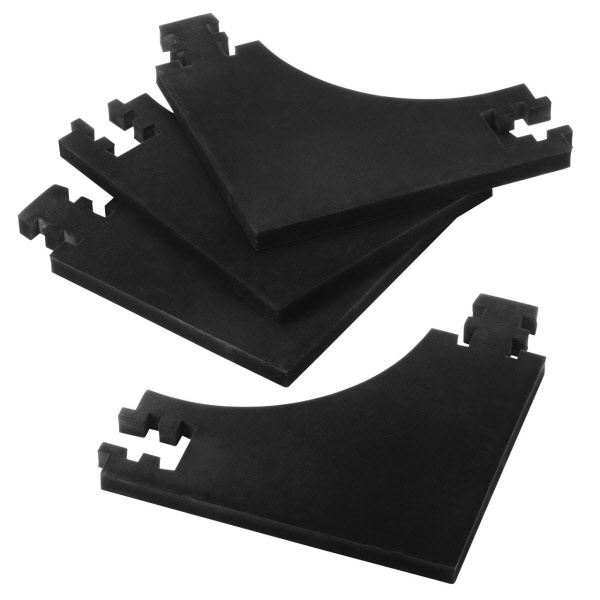 Constructed from one inch thick high density polyurethane for enduring protection. 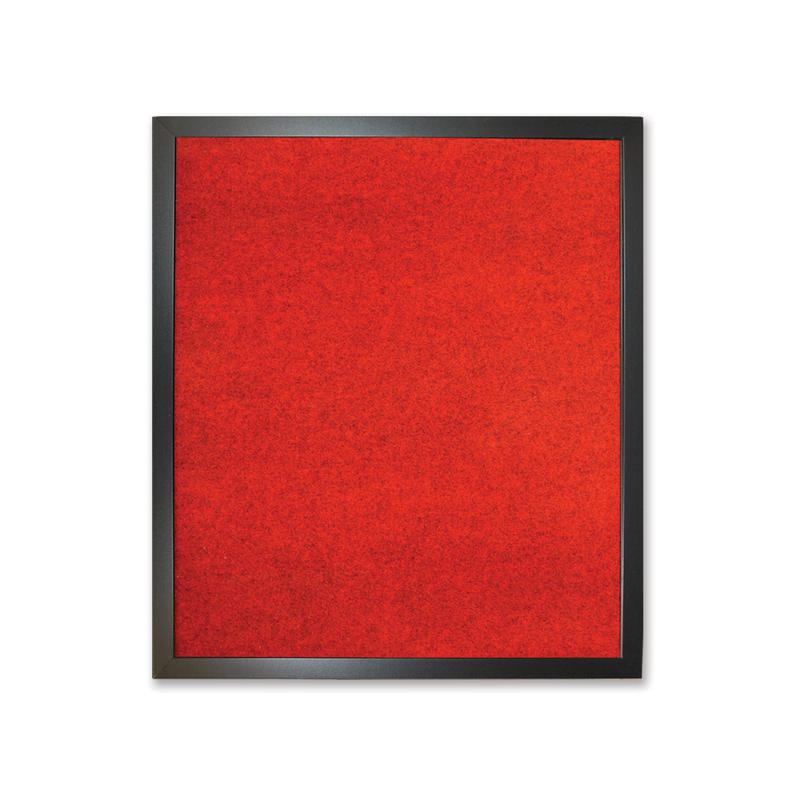 Protects your wall for an astonishing 2.7 square feet! 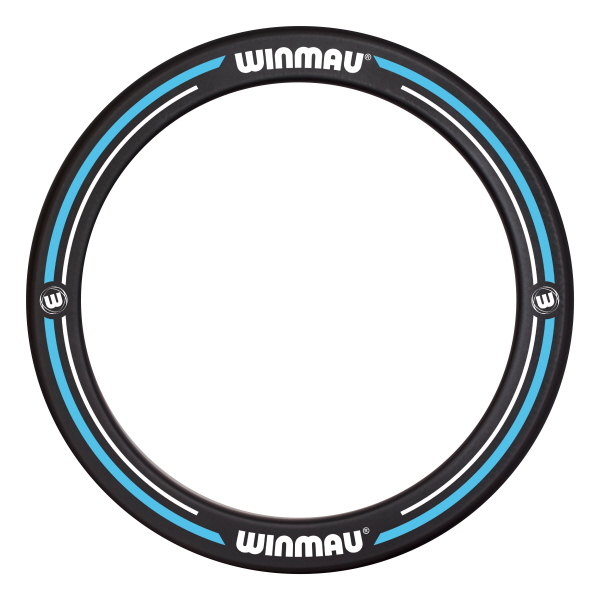 Fits perfectly on most regulation sisal dartboards. 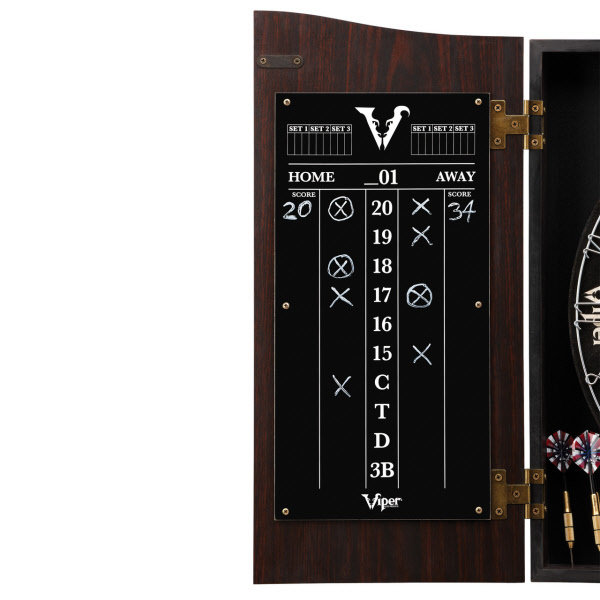 Enjoy your dart games in whole new ways and keep it safe with the Viper Hideaway Dartboard Cabinet for steel tip darts! 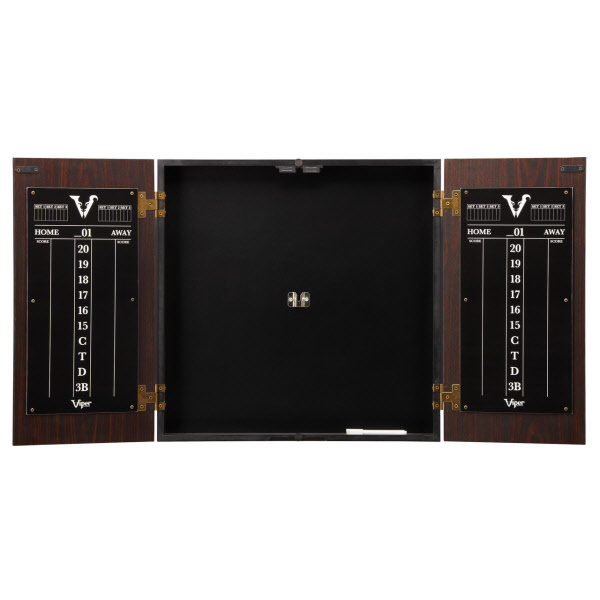 This cabinet will complete the look of any game room with a classic matte black traditional finish. 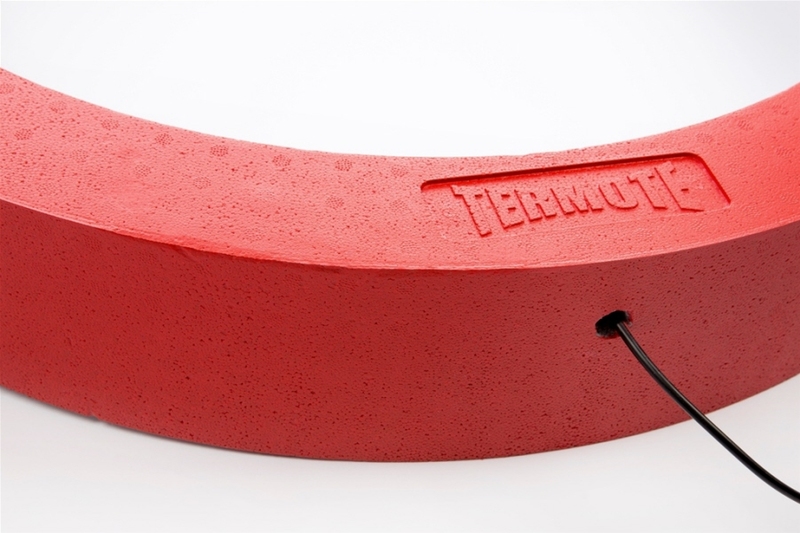 Don’t leave your wall unprotected from errant throws! 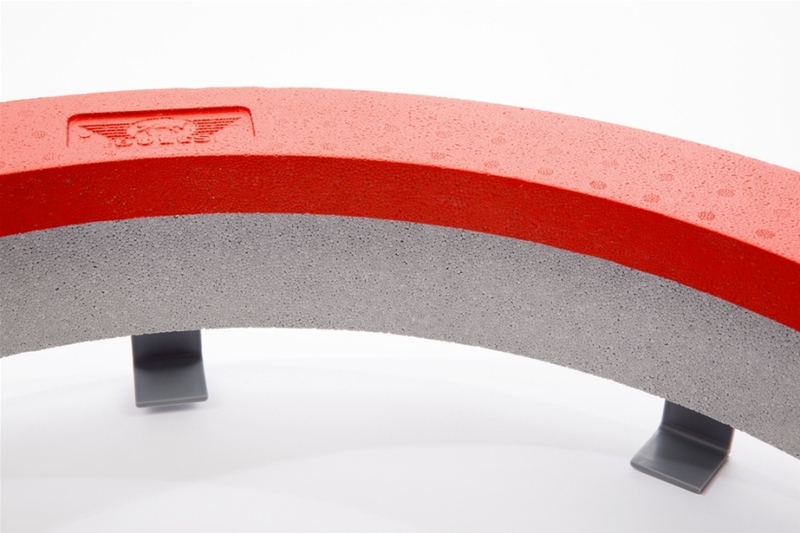 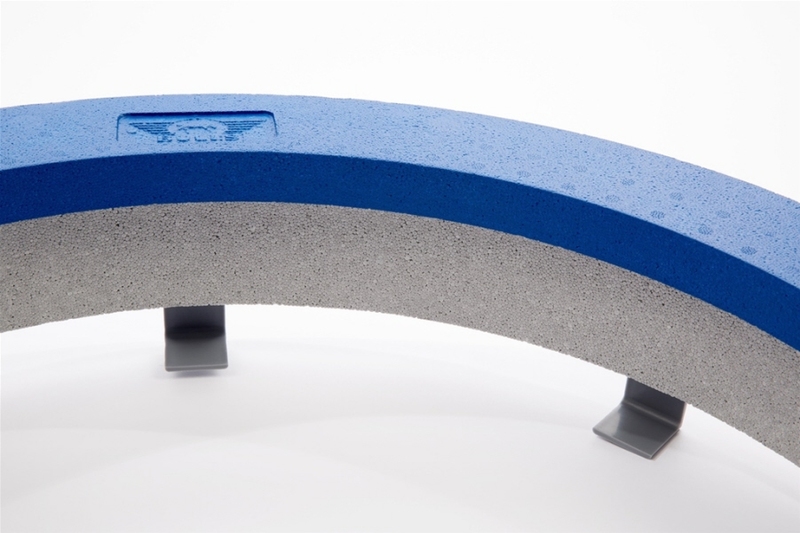 The Hideaway has a coated finish meant to absorb the toughest of impacts. 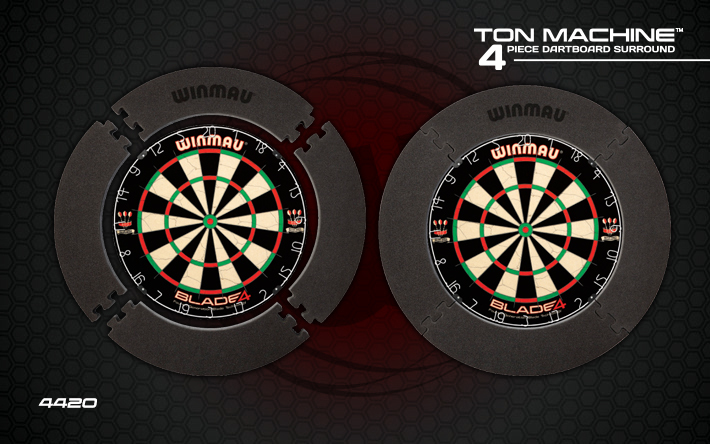 The sharp, sleek design will complement most decors and will ensure that your dartboard doesn’t clash with your style. 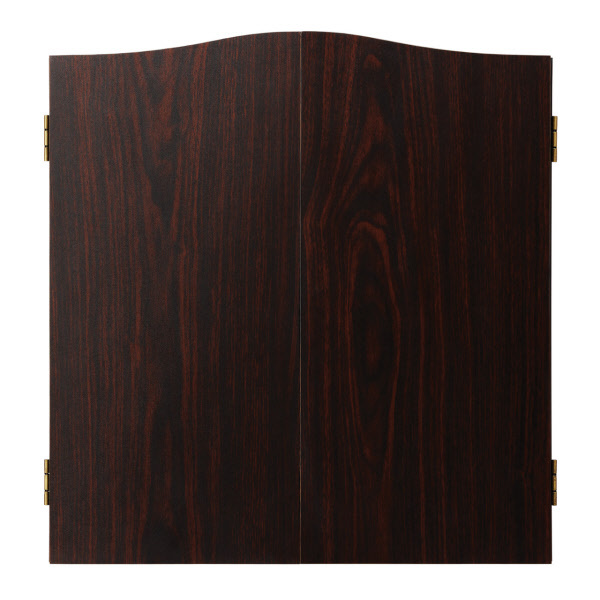 The Hideaway has tons of features to make it the best cabinet for your needs! 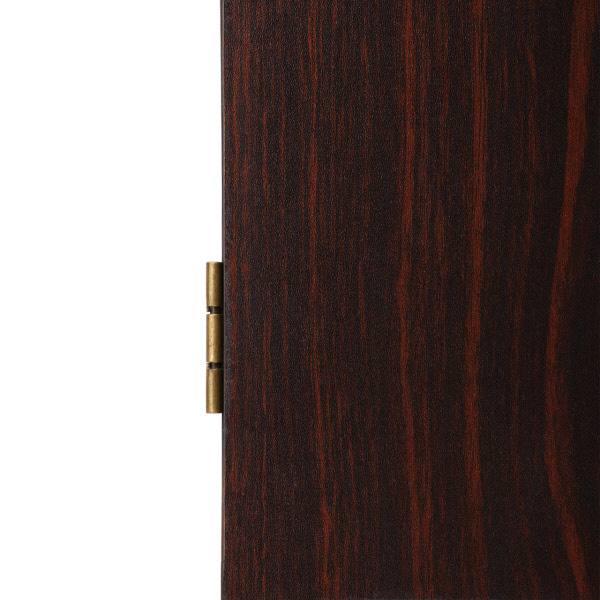 The magnetic door lock will keep the doors from swinging out and obstructing your rooms, while printed directly onto the doors are scoreboards for both ‘01 games and Cricket. 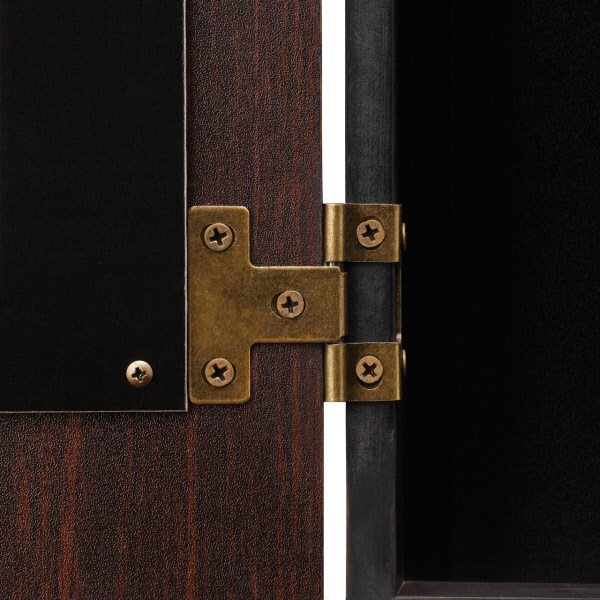 The hinges of the Hideaway’s door feature an antique brass finish to complete the classic look of this cabinet. 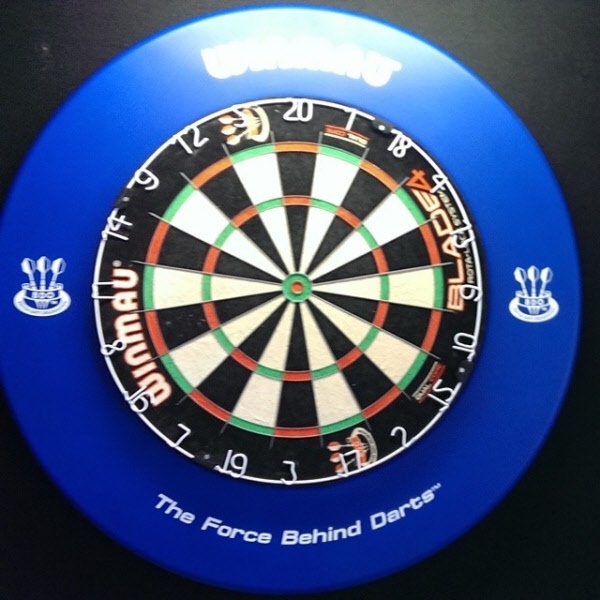 Underneath the main dartboard area are slots to hold up to six darts upright, to avoid folding the flights, and chalk for the scoreboard, so it doesn’t go missing. 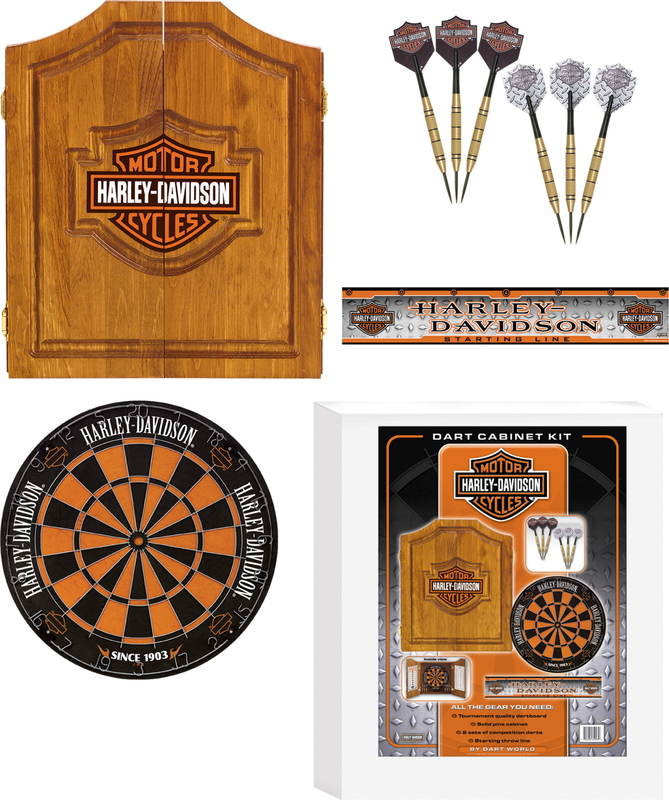 The most exciting aspect of the Hideaway however is the included dartboard, meant for use with steel tip darts. 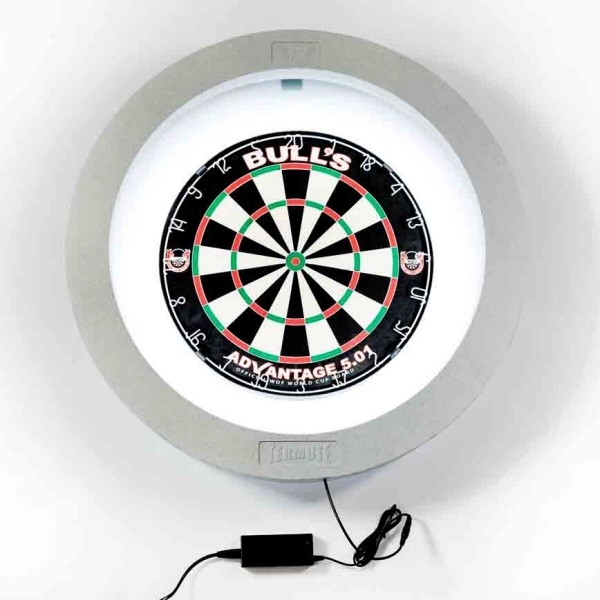 The included dartboard is two sided, on one side you can play a traditional game of darts, like 301 or cricket variations. 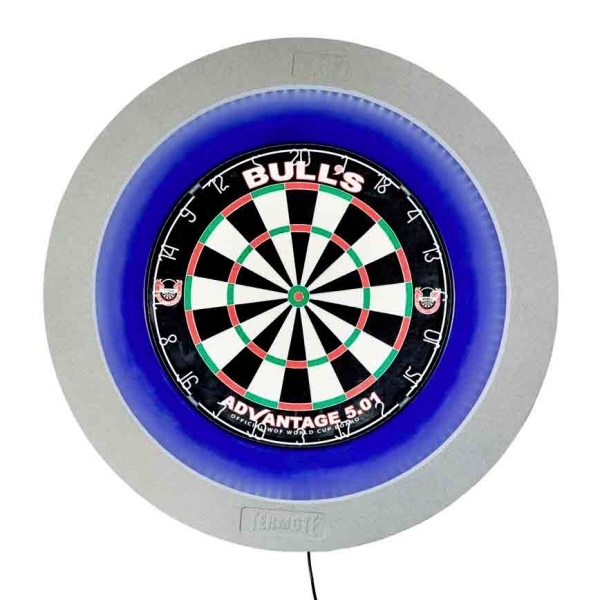 On the other, there is an exciting alternative in baseball darts, meant to emulate America’s pastime with this fun take on darts. 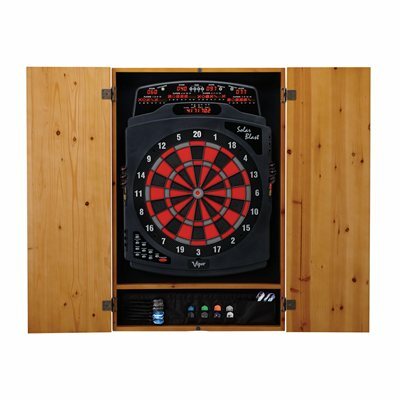 Your dart room isn’t complete until you have a cabinet in which to store it! 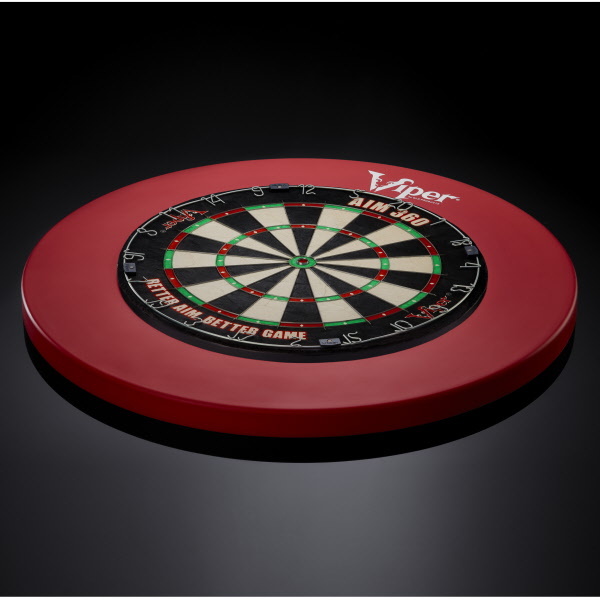 The Viper Hudson All-In-One Dart Center includes dartboard cabinet, Shot King dartboard, and two steel tip dart sets. 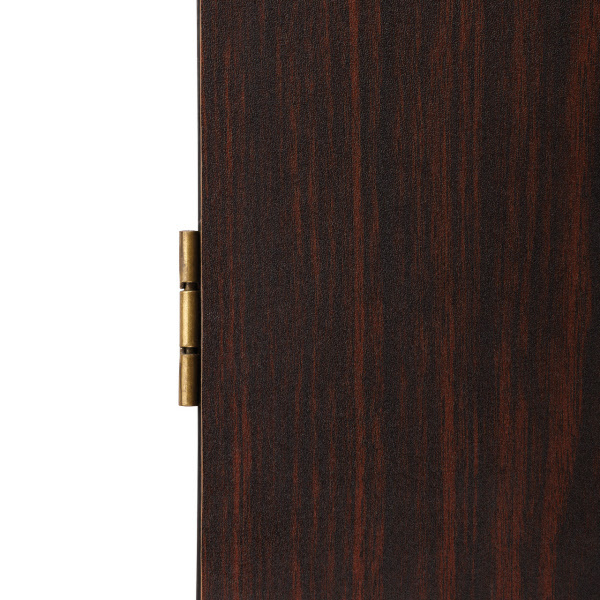 Quality constructed cabinet comprised of solid pine, box joints, and self-closing brushed nickel hinges. 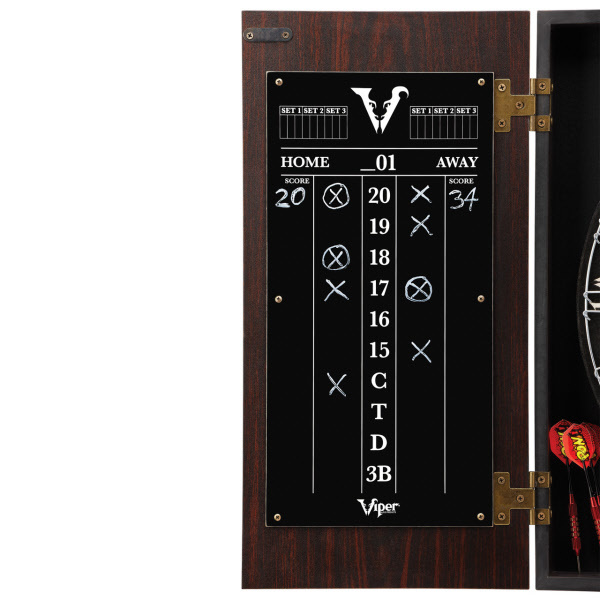 Complete the look of any game room with a classic Viper Stadium Dartboard Cabinet with Shot King Dartboard. 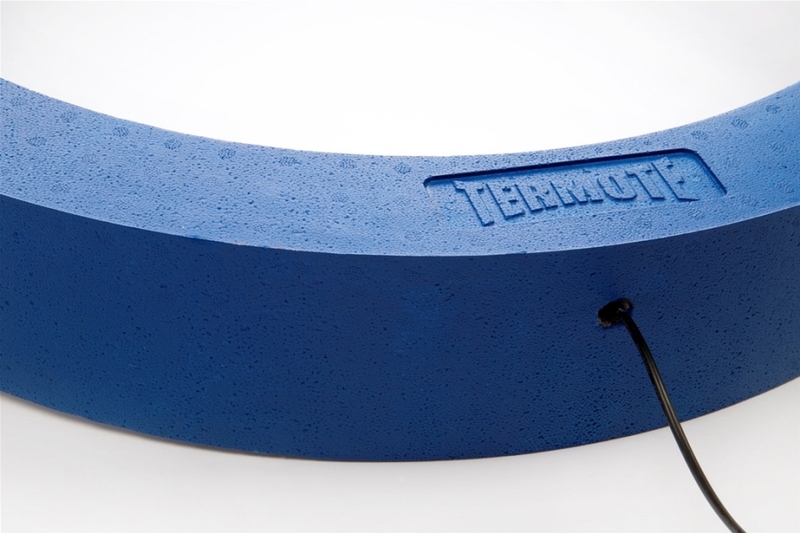 Don't leave your wall unprotected from errant throws! 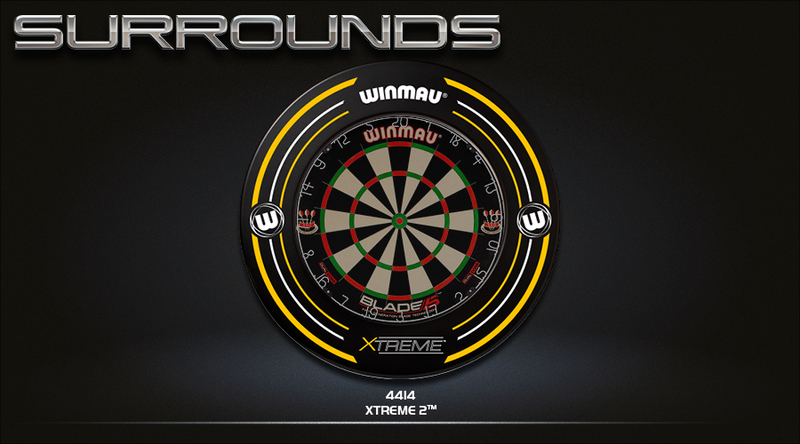 The Stadium is constructed from wood with a classic walnut finish meant to absorb the toughest of impacts. 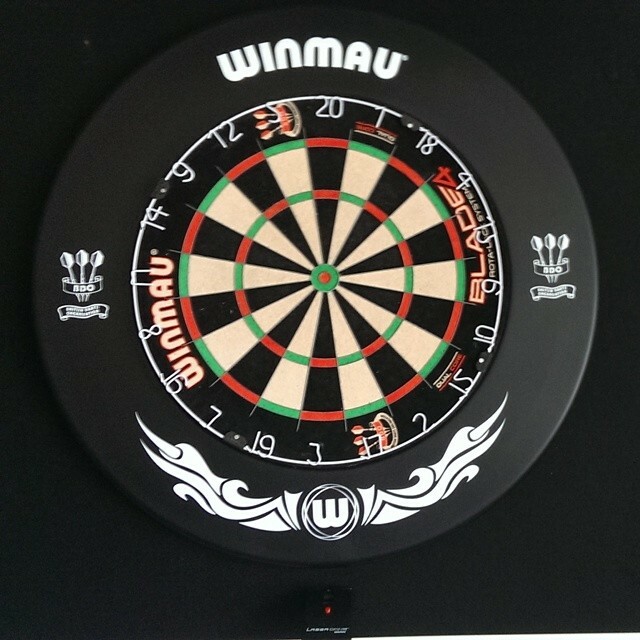 The sharp, sleek design will complement most decors and will ensure that your dartboard doesn't clash with your style. 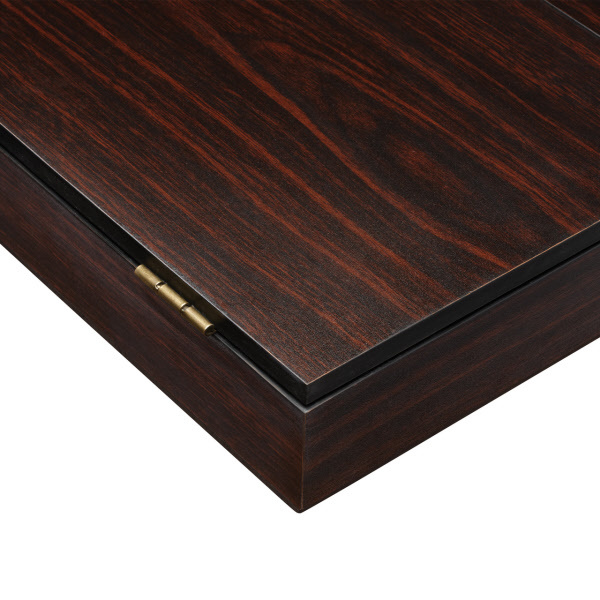 The Hideaway has tons of features to make it the best cabinet for your needs! 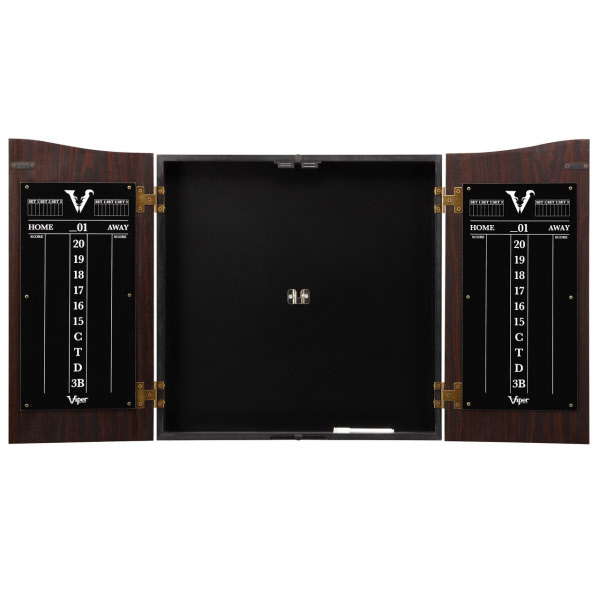 The magnetic door lock will keep the doors from swinging out and obstructing your rooms, while attached directly onto the doors are dry erase scoreboards for both 301 games and Cricket suitable for up to for players. 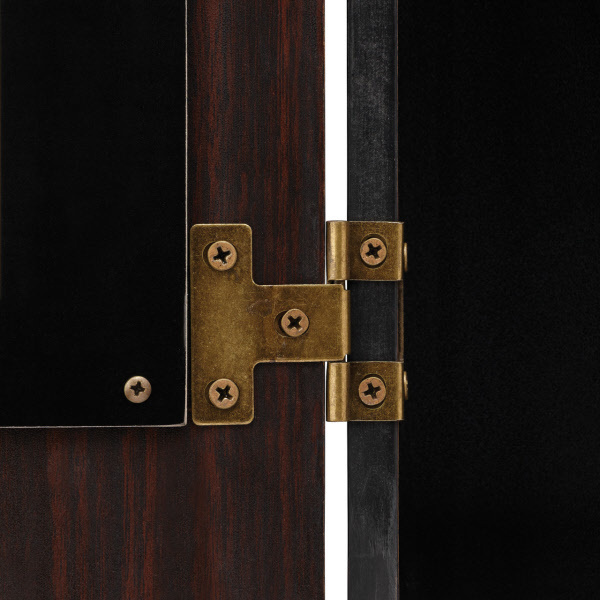 The hinges of the Stadium's doors feature an antique brass finish to complete the traditional look of this cabinet. 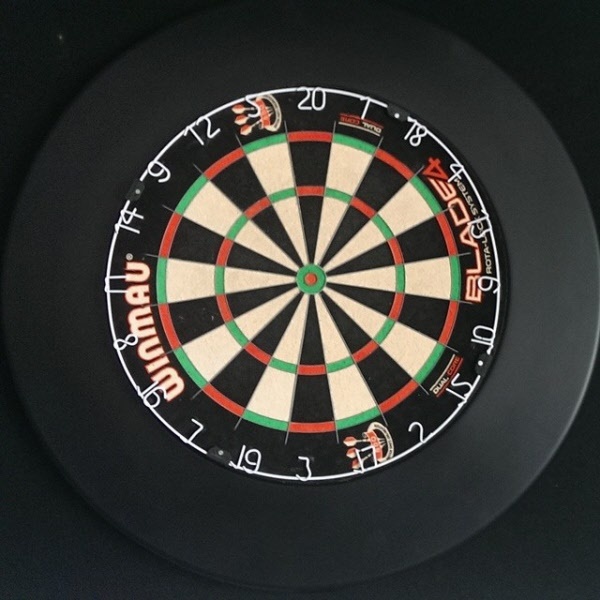 Underneath the main dartboard area are slots to hold up to six darts upright, to avoid folding the flights, and dry erase marker for the scoreboard, so it doesn't go missing. 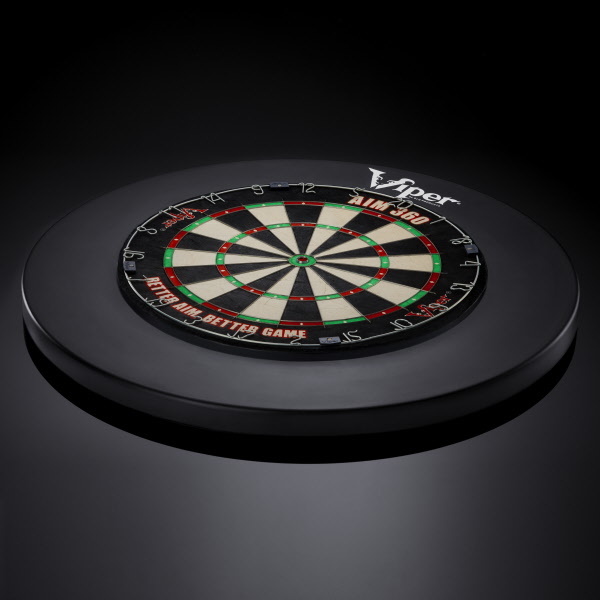 Included with your dartboard cabinet is a Viper Shot King Sisal Dartboard, one of our top selling dartboards. 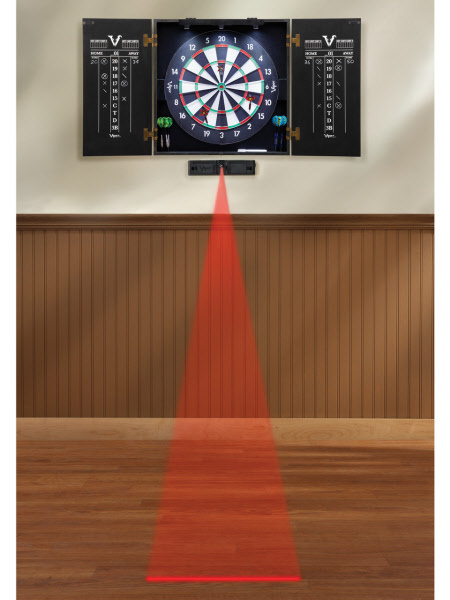 Featuring top quality sisal fibers, the Shot King is designed to self heal and last much longer. With a staple free bull and rounded spider wires, bounce outs are reduced to a minimum. A removable score ring allows you to rotate your board so it wears evenly. 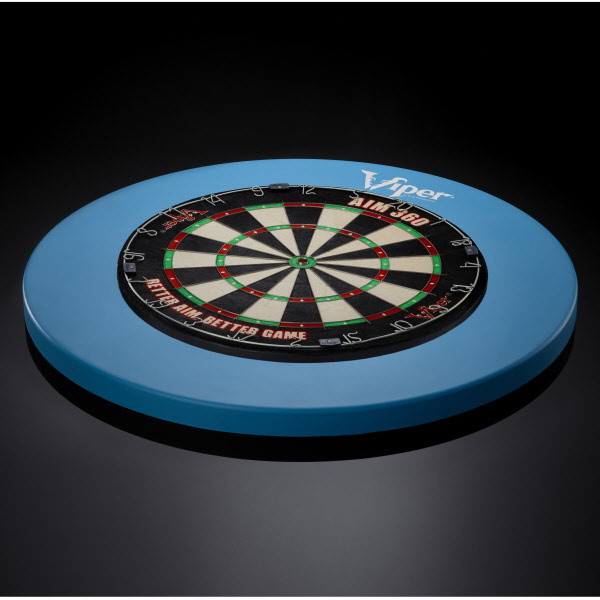 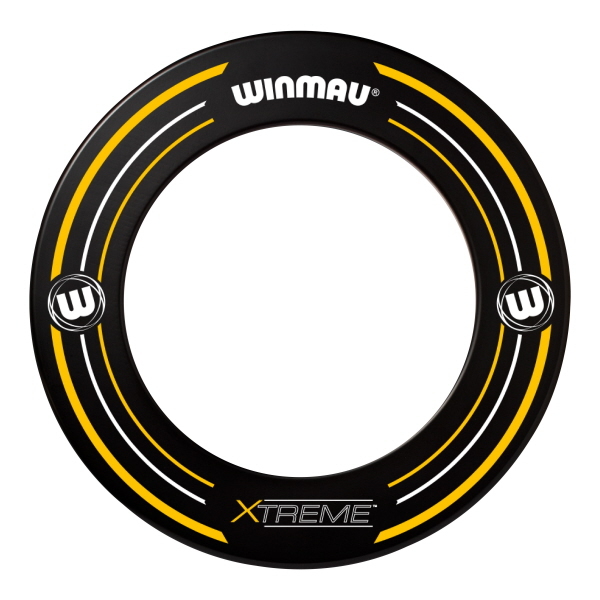 The regulation dartboard measures 18" in diameter for a tournament level experience. 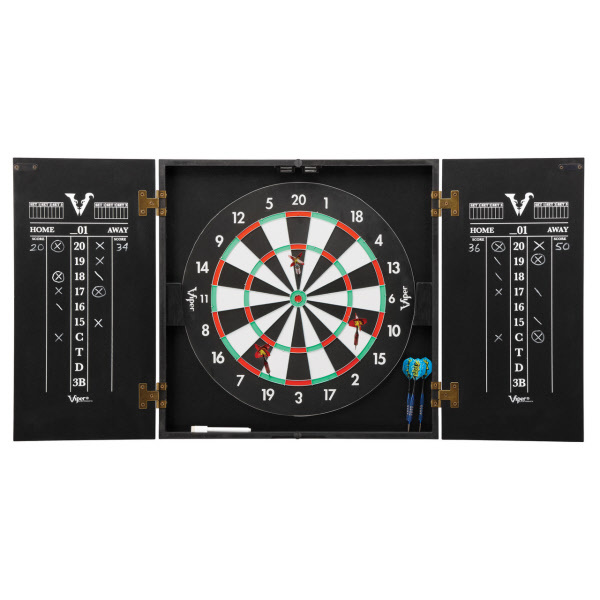 Your dart room isn't complete until you have a cabinet in which to store it! 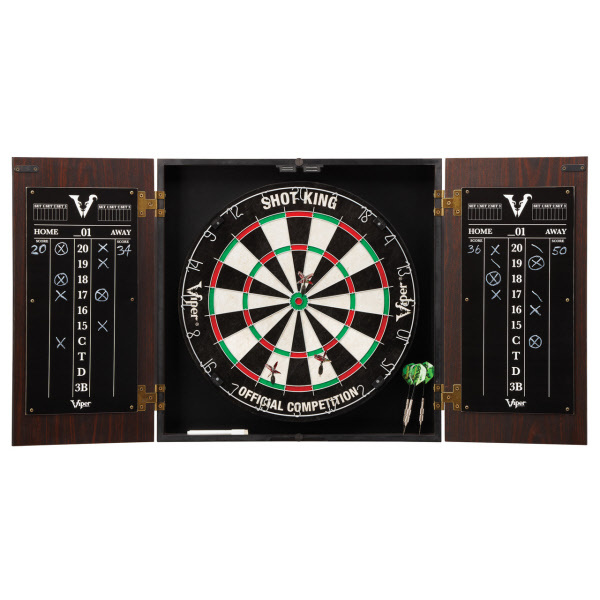 Complete the look of any game room with a classic Viper Vault Dartboard Cabinet with Shot King Dartboard. 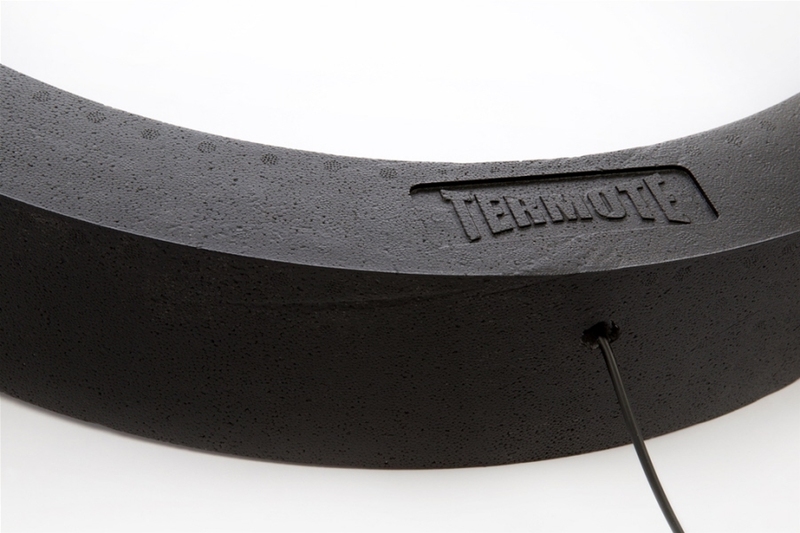 Don't leave your wall unprotected from errant throws! 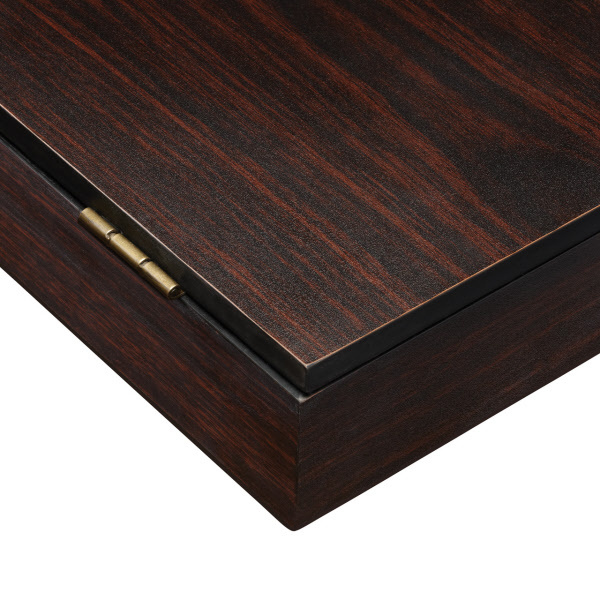 The Vault is constructed from wood with a classic walnut finish meant to absorb the toughest of impacts. 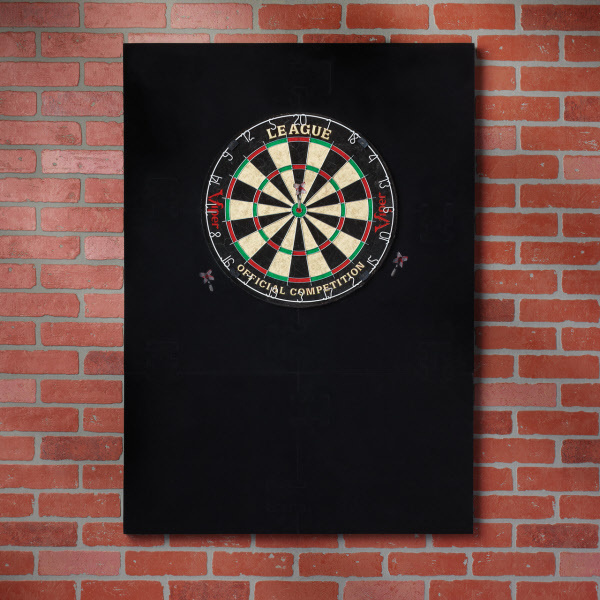 The sharp, sleek design will complement most decors and will ensure that your dartboard doesn't clash with your style. 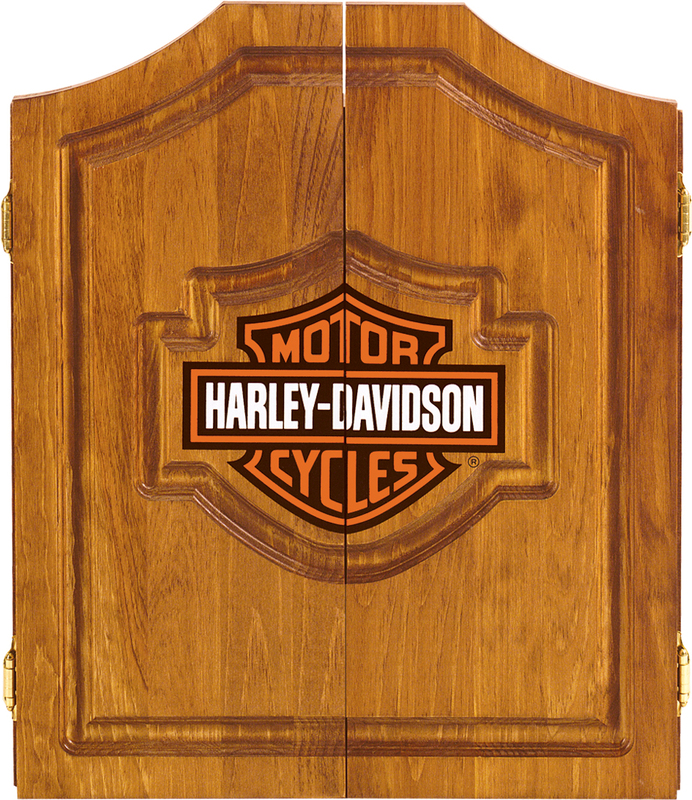 The Hideaway has tons of features to make it the best cabinet for your needs! 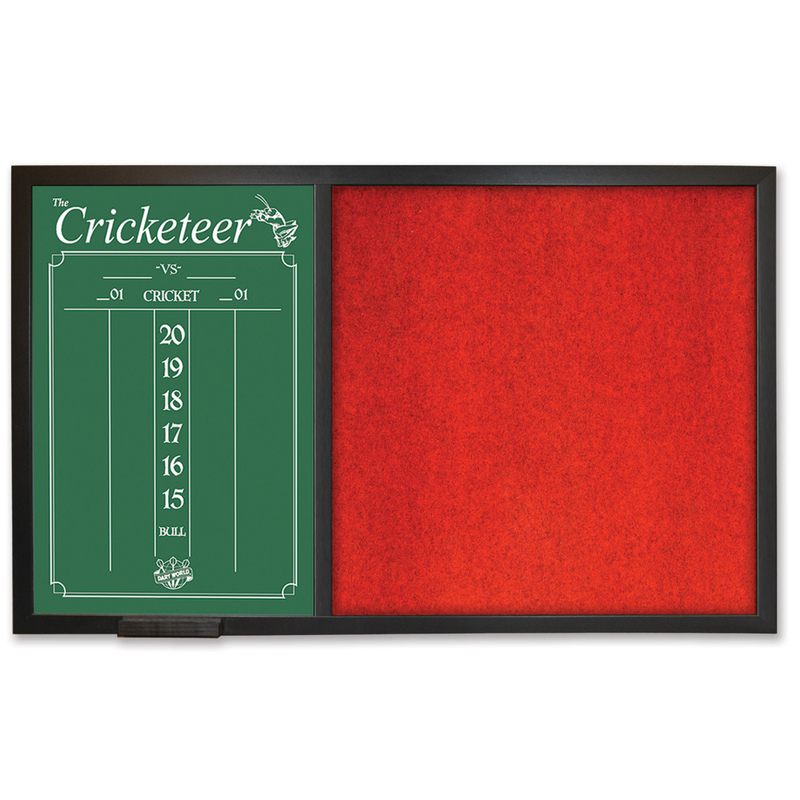 The magnetic door lock will keep the doors from swinging out and obstructing your rooms, while attached directly onto the doors are dry erase scoreboards for both 301 games and Cricket suitable for up to for players. 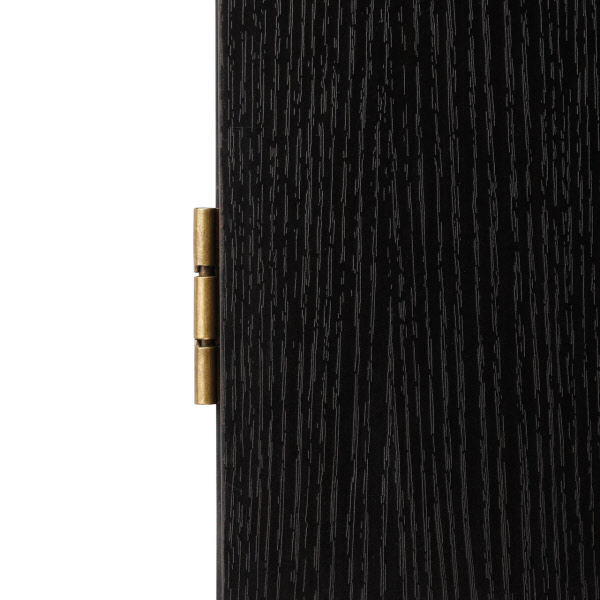 The hinges of the Vaults doors feature an antique brass finish to complete the traditional look of this cabinet. 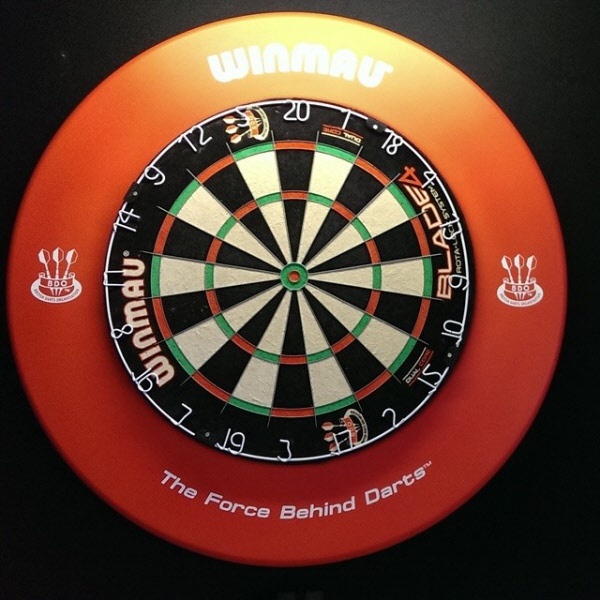 Underneath the main dartboard area are slots to hold up to six darts upright, to avoid folding the flights, and dry erase marker for the scoreboard, so it doesn't go missing. 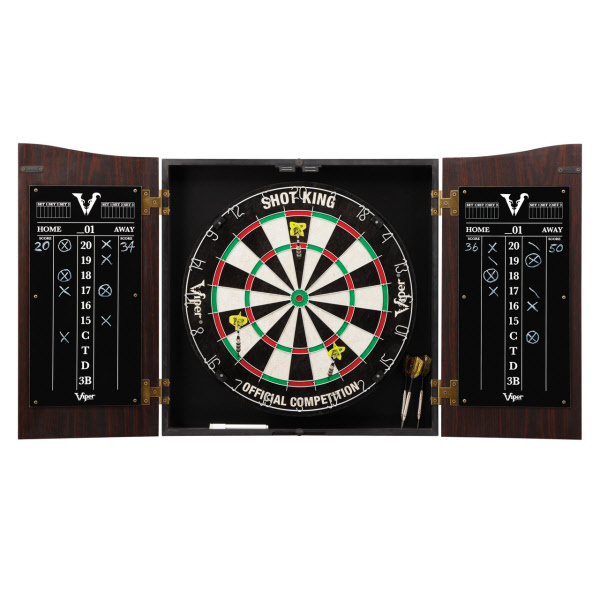 Included with your dartboard cabinet is a Viper Shot King Sisal Dartboard, one of our top selling dartboards. 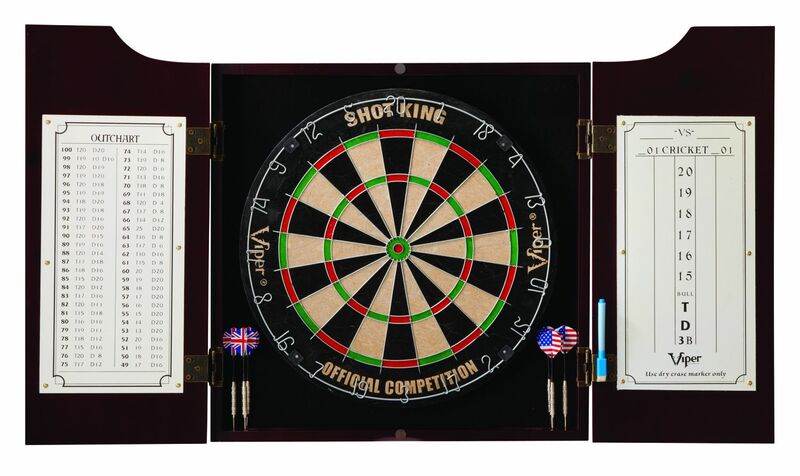 Featuring top quality sisal fibers, the Shot King is designed to self heal and last much longer. 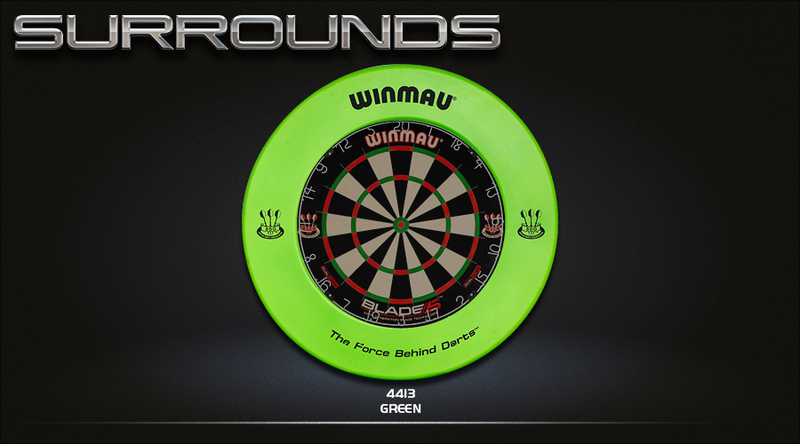 With a staple free bull and rounded spider wires, bounce outs are reduced to a minimum. 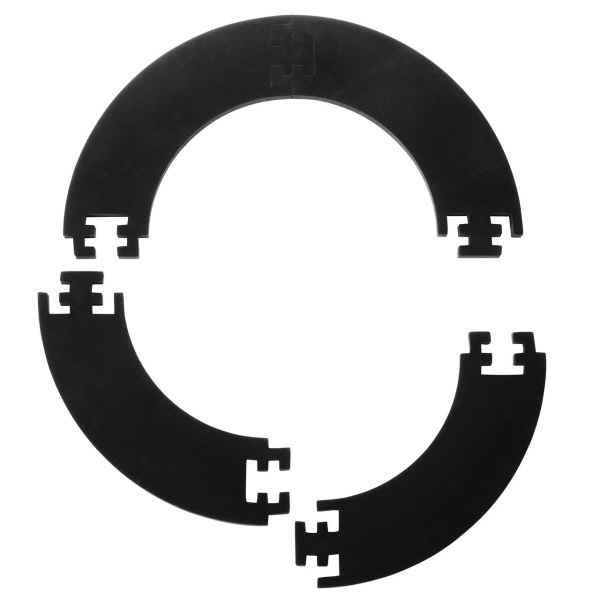 A removable score ring allows you to rotate your board so it wears evenly. The regulation dartboard measures 18" in diameter for a tournament level experience. 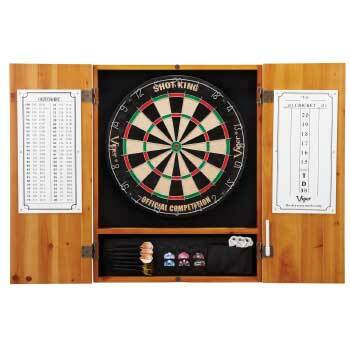 Your dart room isn't complete until you have a cabinet in which to store it!